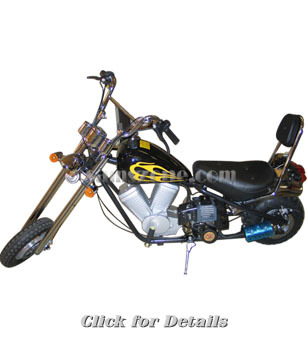 Gas powered mini choppers on this page range from $315 to $549. The S880 is the most inexpensive mini chopper that I represent. What struck me immediately was the level of detailing this gas powered mini chopper has. Working lights both front and back, functional mirrors and a high-back seat round it out. Note the different size wheels in front and back to emphasize the "chopped" look. The rear wheel is actually comprised of two tires. I cannot comment on why they design them this way, but have seen it done on other gas mini-choppers. This is what is best described as the classic mini Harley seen advertised all over the net. It uses different sized wheels to obtained it's chopped look and actually has a fake motor under the gas tank to add further realism. This custom mini chopper is fairly large compared to it's Pocket Harley Gas Scooter peer which costs $200 more but is worth taking a look at to see how else the treatment can be done. This mini chopper looks similar in design to the Mini Harley series, except for the heavily raked and extended front fork. It has the same treatment with the imitation engine, but also has a massive 14.5 inch tire and disc brakes front and back. Full directionals and the dual exhaust round out the look. 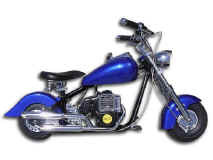 This is only mini chopper I have seen that splits the exhaust left and right, as opposed to over/under. If you go to the link provided above, you will also see that that front forks are a dual tube arrangement. Very, very unique. With the exception of the fake engine, I think this is one of the sharpest mini choppers out there for the money. This mini chopper comes with a 49cc engine, headlights and 1 into 2 exhaust system that must sound great. The specifications for this custom mini chopper calls out drum brakes, but from the picture it looks like the rear wheel has a disc brake arrangement. I am sure the 51" length is not the wheel base but rather the rubber to rubber tire measurement, from the front wheel to the back. It's not a bad looking design with ample rake in the front forks (from the pic it appears to have front shocks). I would have done the front fender a little different, but it's not bad as is. The specs and description of this mini chopper appear to be identical to the Mini Chopper Cruiser CX1 in the review above this one. Again, the brakes appear to be drum in the front, disc in the back despite the specifications calling out drum front and back. I like the design of this custom mini chopper much better than the previous one. The full spring seat and full fairing fenders give this a much more open frame look. So many of the mini choppers appear to have everything crammed into their tight frame, but this design has lot of open areas. 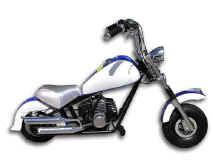 This may more appropriately be referred to as a mini-chopper, but the site that carries it, represents it as a Pocket Bike. No matter what you call it, I like the lines of this pocket bike are second to none. It has the big, post seat reminiscent of the early Indian Motorcycles, the huge Cyclops headlight and check out the teardrop gas tank and low rider fenders. I actually prefer the open frame design to a lot of fairing which hides the engine and frame. This pocketbike has the classic obtuse triangle frame design, giving it that chopped appearance while keeping the tire sizes equal. The engine size is not stated, but with the stated top speed at 30 I will guess it's in the 42-43cc range. It would be nice if they told you what sort of drive system it had too. From looking at the large pictures it would appear to be a chain drive. Look how they relieved the rear fender to let the chain clear it. You really need to check out the larger images to fully appreciate the design. The dual disc brakes are a nice touch, as are the spokeless rims. Like this format? Click here for a sneak preview of over 100 pocket bikes, mopeds and gas scooters!